On 21 December 2016 Alan Straton from MyPE wrote about the Scuba Diving opportunities in Port Elizabeth. Book a Scuba Dive Experience HERE. 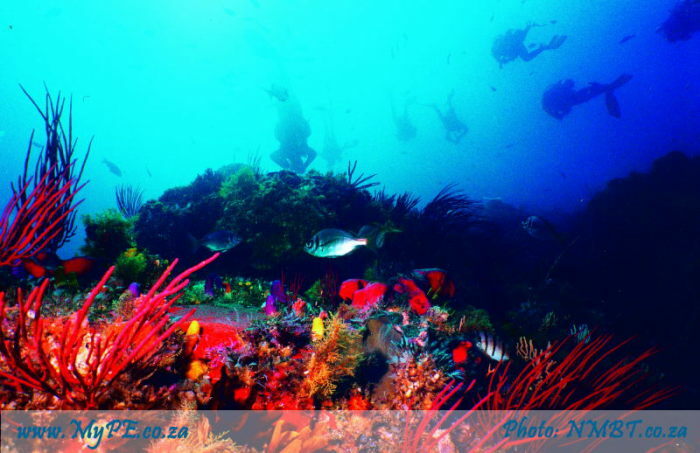 Divers in the know rate Port Elizabeth’s Algoa Bay as one of the best dive spots in the world. Algoa Bay is bounded in the west by Cape Recife and in the east by Cape Padrone, and much of the shoreline is sandy beaches. The greater metropolitan area extends some distance to the west of Cape Recife, and this rocky part of the coastline includes a number of the most popular dive sites. “The Friendly City” has a subtropical climate with light rain throughout the year. The area lies between the winter rainfall, Mediterranean climate zones of the Western Cape and the summer rainfall regions of eastern South Africa. Port Elizabeth is within the warm temperate Agulhas bioregion, which extends from Cape Point to the Mbashe River. No special equipment is required for most of the sites. Wet or semi-dry suits will be adequate for most divers most of the time, though for those who wish to do multiple dives of longer duration, or are sensitive to the cold, a dry suit is recommended. If you intend to dive autonomously, rather than follow thr divemaster, a DSMB (Delayed/deployable Surface Marker Buoy) and reel or spool is recommended. Port Elizabeth is home to the annual Noordhoek Wildside Dive Festival which is held every June at the Noordhoek dive and boating club on Marine drive, towards Schoenmakerskop. Divers from all over South Africa gather for a three-day festival of Scuba diving. Several boats make strictly scheduled launches several times per day depending on conditions, and dives are generally limited to 30 minutes to allow schedules to be kept. Dive operators and other sponsors from Port Elizabeth and surrounding areas support this festival of diving which was started in 1999 and has grown to be the best known and probably largest event of its kind in South Africa. The organisors and crew are all unpaid volunteers, and the takings go to charities: deposits are not refundable. The festival is well organised, but can be disrupted by adverse weather conditions. Dives on about 9 different dive sites with maximum depths from 10 to 26 meters. Colourful reefs with hard and soft coral and a wide range of other organisms. On site tank refills, basic equipment hire, shuttle service from parking area…and secure parking. Stalls with leading brands of dive gear for sale. Refreshment stalls and bar facilities. Lucky draws and prizes every day (your dive booking tickets go into the draw). On site entertainment sideshows. Details vary from year to year, but have included powerlifting displays, rescue competitions, aerobatic displays and the like. Dive Expert Tours offer Marine Adventure Tours launching from the Algoa Bay Yacht Club on the PE Waterfront or Noordhoek. Silke and Rainer Schimpf offer an unforgettable Indian Ocean adventure offering the Big 8 (Dolphin, Whale, Shark, Elephant, Rhino, Buffalo, Lion and Leopard) in one package. and Expeditions on the Ocean anywhere in South Africa. Expert Tours specialise in adventure tourism, film & photo crews and Marine Logistics. Guests are offered individual service and a family holiday atmosphere. Expert Tours is based at 23, 7th Avenue, Walmer and can be contacted on 041 581 2486. Pro Dive is a PADI 5 Star Career Development Centre offering a wide range of underwater programs for the whole family from beginner to instructor courses, all conducted by highly qualified instructors. The company was started by Louis and Michelle van Aardt who had a passion for diving and travel. Their business grew from a small outlet known as the “Red Windmill” on the beach front to the established world class diving centre that it is today. Training Facility: A world class dive centre includes lecture rooms, training pool, hot showers, change rooms, show room & travel office to cater for all your diving requirements. Charter Operation: Dedicated Dive Boats operate from Hobie Beach providing easy and quick access to the numerous dive sites in Algoa Bay. Equipment Rental and airfills are available on site. Career Development Program: Pro Dive offers a unique education program. Candidates who successfully complete the program become highly sought after, both in SA and overseas. Travel Office & Sardine Run Operator: ProDive Travel also specializes in dive tours along the South African coastline, having been one of the longest operators offering the well known Sardine Run. Watersport Adventure Centre: The Pro Dive charter office is ideally situated inside the Red Windmill at Hobie Beach opposite the Boardwalk Casino and Hotel Complex offering various water sport activities such as snorkeling, kayak trips, one day scuba diving courses. Airfills and equipment hire are available on site. Pro Dive is situated at 189 Main Road, Walmer and can be contacted on 041 581 1144.